If you want to have the feeling of having an eternal summer in your room, why don’t you go for a summer/beach theme? Look for bright colors and fun summery accents that will turn your room into a wonderful, relaxing haven! Many of you might find it a bit intimidating to decorate your own room (especially when you think of the cost to create one), but you can actually make unique pieces with just a bit of DIY magic dust! 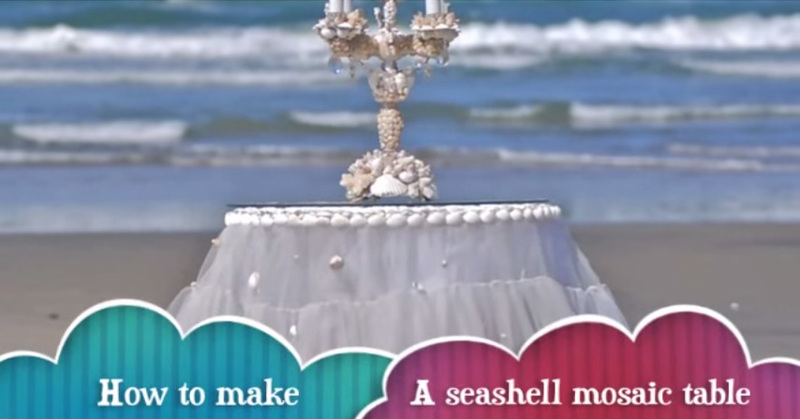 Here’s a tutorial by Debi’s Design Diary that will teach you how to make an amazingly beautiful seashell mosaic table that will add more character to your summer themed room! 1. You don’t have to buy an expensive table for this project. All you have to do is to look for any garage or yard sales within your area so that you can get one that will fit your budget. Goodwill is also a great store to look for awesome finds. You can also check out online shops like eBay. 2. Instead of painting your table white, try painting it in an aqua shade like ultramarine/ turquoise/cobalt blue. This will enhance the Neptunian theme and the beauty of the seashells and starfish – and you can always add gold or silver spray! 3. You can also choose to paint your seashells in different colors to create a beautiful mosaic art. You may need to paint the rest of your table white so that the colored shells will stand out more. 4. If you have an old chair, you can use it as a decorative accent for your room! Repair any broken parts and paint it in white or any summery shade. Cover the chair with your seashells. Use this DIY’d chair for your potted plants or use it to hold your books, pictures or scented candles! 5. If you don’t have seashells, use flat pebbles instead! Your table will look just as good! Do you get tired of facing a blank wall each and every day? Putting up wall decor and framed pictures are some of the usual things that you’d use to bring life to your walls. But if you want to add more character to your wall decor, why don’t you try creating “floating book shelves”? We discovered a great tutorial by Felicia Kramer that will teach you how to make floating book shelves that will definitely add a whimsical charm to your room decor! The link to the full tutorial follows after our comments and suggestions. 1. If you don’t want to use your actual precious books for this project, you can look for old hardbound books at thrift stores that have interesting titles. If you don’t like the color, you could paint them according to the color palette of your room. You could make a stencil template of the title that you want to write on the side of the book. Try to use positive phrases like “Nuggets of Happiness” or “Live, Laugh, Love”, or a short quote, or some other memorable title. Stick the template on the side of the book and paint a gold metallic paint over the template. Once the paint has slightly dried, remove the template. 2. If you want to create a stack of books, make sure that the second book is smaller and thinner than the first one. Use a good glue to stick the books together. 3. For homes that have pet cats, make sure to set the shelves a bit higher so that the cats won’t be able to reach the shelves and cause chaos! Keep any chairs or tables away from the shelves so that the cats won’t use them to reach for the floating books. 4. Try to add more color to your decor but make sure that it blends well with the color of your room. For example, if you have a pink wall, try to get different colored faux flowers but make sure that you include blooms that are in the same general color palette as your wall. 5. Complement your floating bookshelf with a 3D picture frame. You can try doing mosaic art. You can also make a magnetic picture frame. 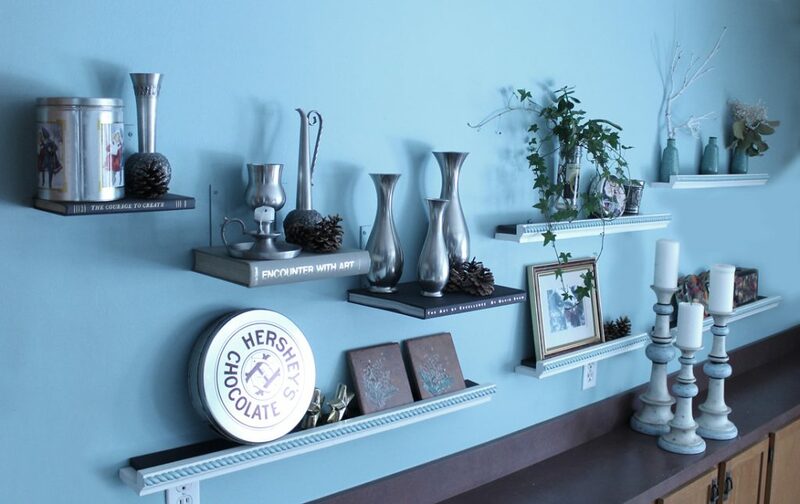 Stick a sheet of metal on your picture frame and fill it in with your magnet collection. We usually associate stained glass with beautiful church windows and other buildings. It’s traditionally made in flat panels but nowadays, artists also use stained glass to make three-dimensional structures and sculptures. 1. This video is really inspiring. It just proves that nothing will stop you from doing seemingly difficult tasks. It just puts everything into perspective! 2. It’s very important to prioritize safety when it comes to handling glass and other materials for this project. You need to wear safety glasses because if the eyes are left unprotected, they will be at risk for injuries. You will also need to wear gloves so that your hands are safe from the sharp glass and the heat of the solder. Work in a well-ventilated area. Line your working area with an old towel and a large piece of glass or tile. Store your tools and materials properly so that small kids won’t get their hands on them and cause accidents. 3. Try to get a basic butterfly template online and determine how much material you would need to get. Here’s a tip: buy at least 25 to 50 % more glass than what is needed for your project. 4. 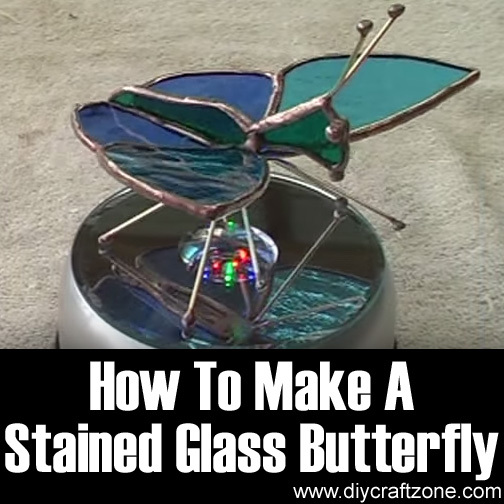 This butterfly sculpture can be displayed anywhere (keep it away from small children though!) and you can even use it to accentuate other decors. 5. You can reuse the extra glass pieces for a mosaic tile project!